Today, the Committee for a Responsible Federal Budget held its annual roundtable conference focused on our country’s long-term fiscal health. It featured an all-star line-up of participants from politics, business, and media, including Federal Reserve Chairman Ben Bernanke and National Economic Council Director Gene Sperling. I watched the whole thing online and found it to be a balanced, reasonable, non-dogmatic discussion. I hope this level-headedness and spirit of bipartisan compromise can make its way into the broader public discourse on these issues. (1) We have to address our long-term structural budget crisis. Unlike global warming, there don’t seem to be any “budget denialists” trying to argue this problem doesn’t exist. We’ve seen it coming for years – as Bernanke pointed out our aging population and booming healthcare costs didn’t appear out of nowhere. The question is how will we fix it? We can deal with it now, in a gradual, deliberate way, or we can let it progress further into a crisis and then deal with it in a panicked, painful way. But there’s no escaping it. (2) Politicians shouldn’t use the debt ceiling limit as a political leverage point. Bernanke, Sperling, Neil Kashkari, and many others spoke out strongly against a political game of chicken around the debt ceiling increase. A default or even a short-term crisis of confidence in US credit could have disastrous long-term effects. Rep. Paul Ryan claimed House Republicans don’t want to use the debt ceiling as a threat but see it as their only option since the Democratically-controlled Senate hasn’t produced a budget (see 0:26:28). (3) Economic growth alone will not get us out of the budget crisis. 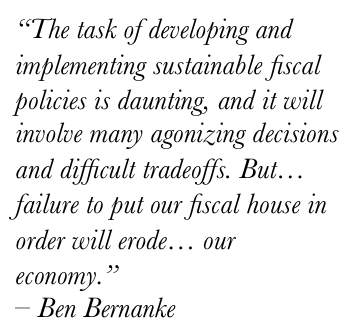 Bernanke, Bob Reischauer, Alan Simpson, and others argued that this is a structural problem we cannot possibly grow our way out of (see 2:11:00). Reischauer, Diane Swonk, and Larry Lindsey predicted that the economy will continue to grow between 2% and 3% annually in the near future, not the 4% projected by the Obama administration or the 5% promised by Republican presidential candidate Tim Pawlenty. 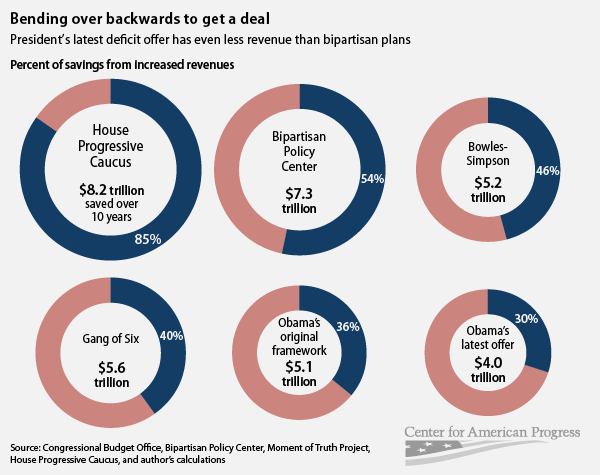 (4) A long-term budget deal needs to address both spending and revenues. Politicians from both sides of the aisle emphasized the need for everything to be on the table, including both revenues and spending. The process will fail if politicians continue to draw hard lines and refuse to even consider entitlement cuts (as some Democrats have) or tax increases (as some Republicans have). One popular proposal is the 3 to 1 ratio: $3 in spending cuts for every $1 in tax increases, which was the proportion settled on by the National Commission on Fiscal Responsibility and Reform and which moderator Steve Liesman was pushing hard today. (5) The public doesn’t understand what’s at stake and that everyone will have to make sacrifices. David Brooks and Ruth Marcus suggested that the American people either don’t care about or don’t understand the significance of the long-term budget crisis. People think there is a simple fix that can somehow avoid new taxes or reduced benefits. 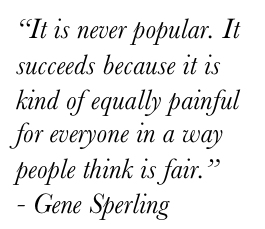 Both Gene Sperling (at 2:42:15) and Gene Steurle (at 2:16:30) made great points about how to frame the issue and the importance of a sense of shared sacrifice. (6) President Obama has failed to lead on this issue. Many at the roundtable stressed the need for strong leadership and asserted that President Obama has failed to explain this issue to the public and sell them on the idea that everyone is going to have to make some kind of sacrifice. As some panelists pointed out, at this point the budget crisis isn’t an economic issue but a political one (though I’d argue that important economic projections, like the growth rate, are still being debated). The questions that remain: Will a comprehensive deal be struck before the Aug. 2nd debt ceiling deadline? Before the 2012 election? What will the balance of spending cuts and tax increases ultimately be? Will a deal really make substantive changes or will we keep pushing the hard stuff off until later?